I’m a passionate person, in general. I use the word “love” a lot (read a post about that here). I fully enjoy good movies, books, wine, and chocolate (the list could go on and on, but you would get bored). Ten years ago, however, if you would have told me that I’d be super passionate about education today, I may not have believed you. I was definitely supposed to be a teacher. I loved my students and was excited to teach new lessons, try new projects, and learn new ways of teaching. But somewhere along the way, my fire started to die out. Teaching became more routine. More of a job. I became less patient with my students, and more exhausted when I got home each evening. I knew something needed to change. About five and a half years ago, I had the opportunity to apply for a position as our district’s curriculum director. To be honest, I wasn’t completely sure I wanted the job. It sounded like something I would enjoy and would be good at, but I was hesitant to leave the classroom. Wouldn’t I miss the kids? So, my husband and I discussed it and pretty much said, “If I’m supposed to have that position then I will get it.” And I did. Here’s the amazing part…my passion for education was completely reignited. I was enthusiastic to go to work each day again. I was forging a new chapter in my life, and a new position for the district. It was challenging and exciting and I loved it. I was working with teachers, and administrators, and constantly learning new things. It was a fantastic fit for me. It turns out that I missed the students I had already taught, not the new ones that I never got the chance to know. So leaving the classroom wasn’t as difficult as I thought it might be. Plus, since I stayed in the district, I still had the chance to see former students from time to time. Fast forward a few years and in the summer of 2015, I had another new exciting career opportunity. I was given the chance to be a full-time consultant. Leading professional development, guiding and encouraging professional learning were my favorite parts of being a curriculum director and now I get to do it for my job! Can you believe it? And that passion, whose flames were being fanned as a curriculum director, just had lighter fluid sprayed on them as an educational consultant. I cannot imagine myself in any other realm but education. I fully believe in the power of innovative teaching and learning, and making our current education systems even better. I am beyond blessed to be a part of that work on a daily basis. 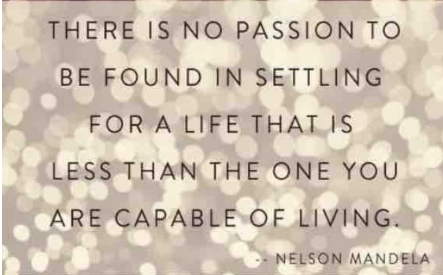 Which brings me to ask, What’s your passion and are you living it? Please share. I love hearing (and learning from) other people’s stories. Let’s connect. This entry was posted in Education, Leadership, personal, Professional Experiences and tagged administration, educational consulting, leadership, passion-based leadership, teaching. Bookmark the permalink.